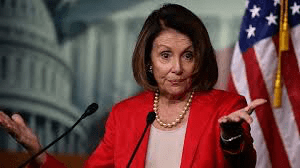 Pelosi…Progressive Democratic wing is’ like 5 people’…..
Of course she meant in her party in the US House …. While the media DOES give the lefties in the party a good amount of sunshine…. Polling would confirm the moderate’s in the party are the most who vote…. And Democratic House members will need votes in Trump country again next year…. House Speaker Nancy Pelosi (D-Calif.) told CBS’s “60 Minutes” that the left flank of the House Democratic caucus represented by Rep. Alexandria Ocasio-Cortez (D-N.Y.) is “like five people” in a Sunday interview. Asked by Lesley Stahl about potential insurrections or pushback from the progressive wing of the party, Pelosi responded, “That’s like five people.” She also disputed that there was a distinction between herself and progressive Democrats, saying she herself identified as a progressive. When Stahl asked for Pelosi’s thoughts on the left wing of the party pushing initiatives such as “Medicare for all,” which Stahl said were “allowing the president to say you’re all socialists,” Pelosi noted the GOP made similar claims when former President Lyndon B. Johnson led the creation of Medicare in the 1960s. “By and large, whatever orientation [House Democrats] came to Congress with, they know that we have to hold the center. That we have to go down the mainstream,” she told Stahl…..